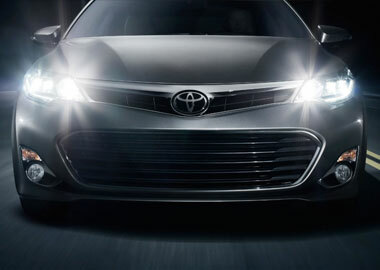 A smooth and powerful 3.5-liter V6 powers Avalon, producing an impressive 268 hp and 248 lb.-ft. of torque. Incredibly efficient with an EPA-estimated 31 mpg highway and Ultra Low Emission Vehicle (ULEV) certification, Avalon is an absolute breakthrough in high-end driving and a bold new direction for the road ahead. Sometimes less can equal more. Avalon’s lightweight body, rigid chassis and impressive drag coefficient of .28 creates a vehicle that is not only efficient but also more responsive to the driver. Avalon has fully independent suspension that adapts to the road to help give you more control. In a world where so many cars look the same, chrome accents and available wide-angle fog lights give Avalon’s face unmistakable character. A focus on brilliance: Quadrabeam headlights focus light from a single bulb into two individual lenses to help you see what’s ahead. 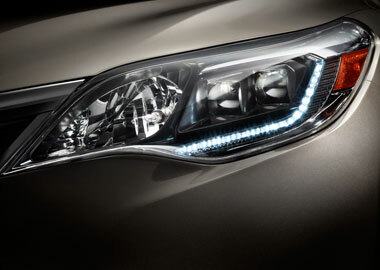 On Avalon Limited, High Intensity Discharge (HID) bulbs, LED Daytime Running Lights (DRL) and an available Automatic High Beam feature create a headlight signature unique to Avalon. Darkness never had a chance. 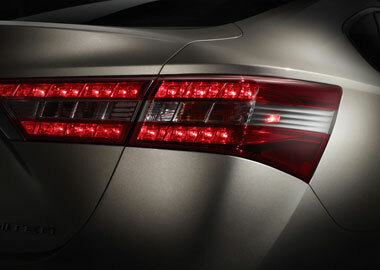 Avalon’s standard LED taillights create a look that is as powerful as it is efficient. Keep technology in its place. Standard on all models, Avalon’s eBin™ features a nonslip surface for your cell phone or MP3 device that’s lit and tilts toward front passengers. Plus, it contains two 12-volt power outlets, an auxiliary audio jack and a USB port. Avalon Limited and Hybrid Limited offer the world’s first in-console wireless charging* surface integrated into the eBin™. Just place your Qi compatible device on the nonslip surface and it charges. Technology that connects. With a compatible smartphone, Avalon’s available Entune® App Suite multimedia system gives you access to more information than ever before. Stream music with Pandora®, locate restaurants with Bing™ and get movie tickets with MovieTickets.com. So much went into this car so you can get even more out of it. Find out all the data you need and still keep your eyes on the road. Avalon’s Multi-Information Display (MID) screen makes it easy to check trip data, outside temperature, distance to empty, mpg and average speed. Optitron gauges make sure everything is easy to read—day or night. On Limited models navigation information is displayed. Avalon’s standard leather-trimmed seats, soft-touch materials and French stitching add up to an environment that feels as if it were made just for you. Subtle design touches make sure that the interior of Avalon stands out. Avalon Limited continues a heritage of ergonomic excellence with standard power-adjustable, premium perforated leather-trimmed heated and ventilated front seats, and premium leather-trimmed steering wheel and shift lever—like they’re tailored to the driver. Three-zone climate control allows a custom level of comfort. Rear passengers can adjust the air temperature for the rear seats without affecting the front, which ensures maximum comfort for everyone traveling. Only found in Limited as Standard equipment. Avalon Limited has available Dynamic Radar Cruise Control (DRCC) that automatically adjusts vehicle speed to help maintain a preset following distance between you and the vehicle directly in front of you. Whether you’re parallel parking or getting out of a tight driveway, Avalon’s standard backup camera serves as a guide. An image of what’s visible to the camera behind you will appear on the touch-screen display whenever you shift into Reverse. The available Blind Spot Monitor (BSM) with Rear Cross-Traffic Alert (RCTA) helps identify vehicles that you may not see when changing lanes or backing out of a parking space by illuminating a warning signal on the correct side mirror. Available on Avalon Limited, the Automatic High Beam (AHB) feature helps visibility when driving at night. The system helps detect oncoming vehicles as far away as 2000 feet and, depending on the circumstances, automatically switches the high beams on and off, making it easier for other drivers on the road. With available Safety Connect®, emergency Roadside Assistance and Automatic Collision Notification are available when you need them through Toyota’s 24/7 call center. Avalon comes standard with a total of ten airbags, including driver and front passenger Advanced Airbag System, driver and front passenger seat-mounted side airbags, driver and front passenger knee airbags, rear seat-mounted side airbags and front and rear side curtain airbags.